CHICAGO — The national law firm of Quarles & Brady LLP today announced that Sherina Edwards and Kevin Slaughter have been named to Chicago's Notable Minority Lawyers by Crain's Chicago Business. Chicago's Notable Minority Lawyers is a list of men and women who are leading the legal profession, in Illinois and beyond. Through their practices and pro bono work, they are advancing the causes of justice and equality. Their stories also reveal that they are mentoring a diverse generation of lawyers to join them on this path. Edwards is a member of the firm's Energy, Environment & Natural Resources Practice Group and focuses her practice on electric reliability, water, natural gas and critical infrastructure issues. Edwards founded both the Women's Energy Summit and the Women's Energy Network of Chicago as well as having strong influence over the creation of the Illinois Utilities Business Diversity Council and the ICC’s Office of Diversity and Community Affairs. She also sits on the Girl Scouts of Greater Chicago & Northwest Indiana's board and Delta Sigma Theta's national executive board. She received her law degree from Howard University. Slaughter is a member of the firm's Business Law Practice Group and focuses his practice in the areas of mergers and acquisitions, airport concessions and commercial transactions. He represents buyers and sellers of public and private companies and counsels boards of directors and financial advisors on acquisitions, take-over defense, and corporate governance matters. 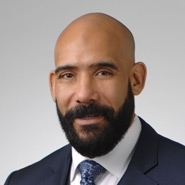 He is involved in several organizations including serving on the board of Chicago Committee on Minorities in Large Law Firms and the Muslim Bar Association of Chicago and is vice president of legal for the Pathways to Adventure Council of the Boy Scouts of America. He received his law degree from Northwestern University.